TMS is an expensive, time-consuming, but effective treatment for depression, but how should it be used for treating patients with chronic depression? And for those who have an initial positive response when should we consider another course of TMS (known as reintroduction therapy)? These are all questions which have not been adequately addressed in the research literature. 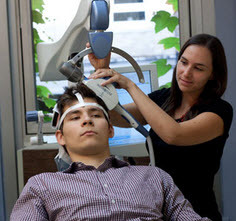 A study published in the Journal of Neuropsychiatry and Clinical Neurosciences in Advance has found that a patient’s response to TMS the first time may predict how well he or she will respond to a subsequent session of TMS. The study authors noted these findings support the use of TMS reintroduction therapy for responders, which could potentially reduce the number of sessions that they might have otherwise received as part of maintenance therapy. The graph at the right shows that there was a relationship between initial response to a full course of TMS and response to a shorter repeat course of TMS. This was not a linear relationship. 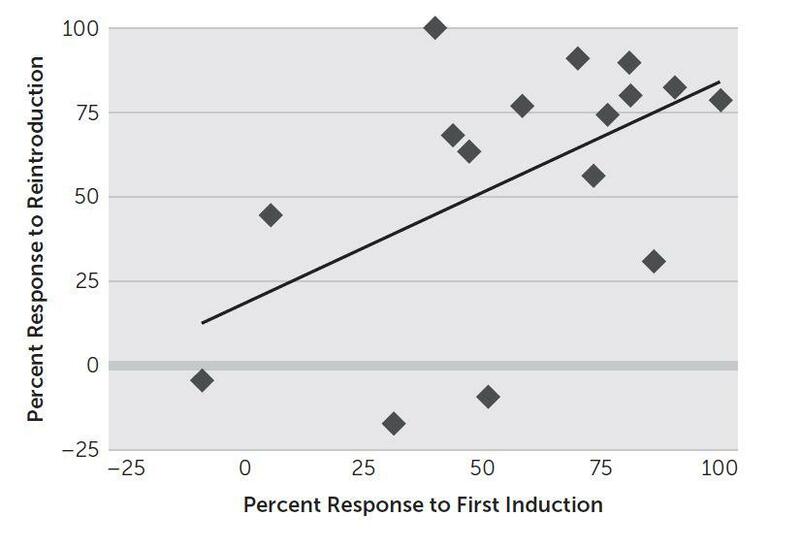 Patients with less than a 25% response to the initial course of treatment (measure by Beck Depression Inventory scores) had essentially no chance of responding to a repeat course of TMS. But those with 25 – 50% response and 50 – 100% response had roughly equivalent rates of response to a reintroduction: 75 – 80% response. A couple of points about the study: although it involved a large number of patients, the number who received reintroduction therapy (as opposed to one course of treatment or ongoing treatment) was small; also, this was a chart review study rather than a prospective or controlled study, so we don’t know how it was that patients were chosen to receive reintroduction therapy and therefore how representative of other patients that group was.